Derek Dascoulias (2019 RHP, Albany, NH): Dascoulias was very effective his three frames, allowing a single run while walking none and punching out six hitters. He worked up to 83 mph with his fastball and created good angles to the plate, and worked in a very good, sharp slider that missed a lot of bats. Andrew Steinhubel (2020 RHP, Waltham, MA): Steinhubel showed a lot to like as a very projectable righthanded arm, working his fastball up to 82 mph and complementing it with a very advanced changeup that was effective at missing bats vs. both righties and lefties. Sam Hill (2021 RHP, Northborough, MA): Hill showed well in his time on the mound, striking out four over his three shutout innings, creating good plane to the plate with his fastball up to 81 mph and moving it in and out and missing a good amount of bats with his sharp, late-breaking curveball. 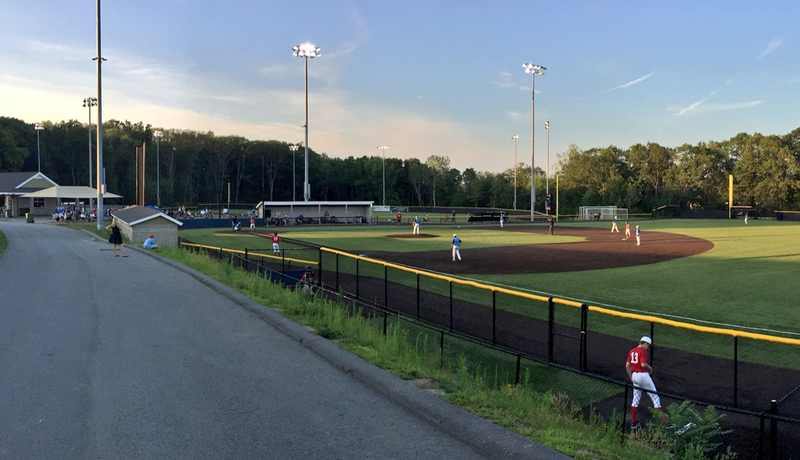 Ethan Student (2019 OF, Hopkinton, MA): Student has had a very good weekend overall and continued that on the mound in this game, working up to 83 mph with his fastball and striking out three over two innings. He missed a lot of bats up in the zone with the heat and landed his curveball for strikes. He also hit a missile of a double off of the left field wall, continuing his all-around excellent weekend. Cole Wojtkowski (2021 SS, Pittsfield, MA): Wojtokowski showed off a very loud barrel in this game, collecting a triple as well as a pair of very well-struck liners that ended up being caught, consistently finding the barrel in a firm manner with good bat speed and elevation. James Patrick (2021 C, South Burlington, VT): Patrick had one of the loudest swings of the day, jumping all over an elevated fastball on the inner third and launching it over the left center field wall for a bomb and then followed it up with a firm liner single up the middle. He combines good present strength and bat speed with a nicely-lofted plane to produce good power. Jake Walman (2022 C, Bourne, MA): Walman showed nice feel for the barrel in this game, working his bat around the zone well and showing the ability to get the barrel on pitches all over the zone, picking up a pair of base hits in the process. Jean-Pierre Catellier (2020 SS, Springfield, MA): Catellier was really good in closing out the game in his one inning, racking up two of the three outs via strikeout with a fastball up to 81 with good life as well as command. He has deception in his delivery and really pounded the zone. John Francis (2021 OF, Wallingford, PA) showed off his speed on the bases today. Francis is an aggressive baserunner with good speed and gets good jumps on the bases. Joshua Beayon (2019 1B, Pittsford, VT) tripled in the game for the Royal team today. Beayon did a good job of squaring the ball up twice today and driving the ball to the gaps. Clayton McAllister (2020 C, Swanton, VT) singled in both his at bats this afternoon. McAllister has an aggressive approach at the plate with a level swing and makes consistent contact. Ryan Hyde (2019 C/RHP, Berlin, CT) double in an at bat this afternoon. Hyde has quick wrists at the plate with an aggressive approach and has pop in his bat. On the mound Hyde had his fastball sitting at 83-84mph with his curveball at 72mph. Hyde works down in the zone getting ahead with his fastball. Andrew Alise (2020 3B, Ithaca, NY) topped out at 84mph this afternoon with his curveball at 65mph. Alise pitches from an over the top arm slot doing a good job of keeping the ball down in the zone. Chris Presinal (2020 1B/3B, Boston, MA) had a good showing on the infield today. Presinal showed good actions at 3rd base with a strong arm across the infield. Dillon Ryan (2019 RHP, Sandwich, MA) topped out at 82mph on his fastball mixing in his slider at 74mph and a changeup at 69mph this afternoon. Ryan pitched a strong 3 innings striking out 6 showing a good feel for his slider and has good arms side run to his fastball. Curran Jacobs (2019 1B, Charlton, MA) doubling in his second at bat of the game today. Jacobs made hard contact both times he came to the plate with bat speed and has a smooth swing. Drew Hudson (2019 2B, Portsmouth, NH) had a hard single to left in his at bat today. Hudson has a short quick swing at the plate with a compact balanced stance. Davis Cook (2021 2B, Carbondale, CO) singled in his first two at bats today. Cook has a contact approach at the plate with good speed on the bases. Henry Green (2020 SS, Plymouth, NH) doubled in the game for the green team today. Green showed a good feel for the barrel with lift in his swing and good speed on the bases. Ryan Van Buren (2021 OF, Meadowbrook, PA) singled in his first two at bats as well today. Van Buren has a sound approach at the plate with bat speed and made solid barrel contact at the plate all day today. Daniel Bae (2021 RHP/2B, Avon, CT) singled in his last two at bats today. Bae has a contact approach at the plate with a level swing. Christopher White (2020 C, South Easton, MA) singled twice in his last two at bats today. White has a line drive swing plane with bat speed. Robbie Long (2021 1B, Dunstable, MA) hit a Home Run in his last at bat today. Long has a good feel for his barrel making loud contact consistently over the weekend. Rocko Brzezniak (2022 1B, Matawan, NJ) hit a Home Run for the Gold team this morning. Brzezniak showed good good feel for his barrel with bat speed and makes consistent hard contact at the plate. Sam Clark (2022 RHP, Scarborough, ME) sat 76-80mph on his fastball this morning mixing in a slider at 67mph and a changeup at 71mph. Clark has a deliberate delivery on the mound with deception. He has arm side run to his fastball throwing it to both sides of the plate for strikes. Cole Tully (2020 OF, Reading, MA) singled twice this morning for the Red team. Tully has a nice swing with bat speed and did a good job of keeping his hands inside. Madison Dina (2019 RHP, Lexington, MA) sat 78-82mph on his fastball mixing in a slider at 73mph, a knuckleball 70mph and a changeup at 73mph. Dina has good break to his slider with a good feel for it and throws strikes to both sides of the plate. Kyle Borrello (2020 LHP/1B, Hamburg, NY) looked good in the field this morning. Borrello made a nice catch against the fence in the 9th inning. Tyler Gonzalez (2019 3B, North Reading, MA) had a stand up triple in his last at bat this morning. Gonzalez showed good barrel skills at the plate with good speed on the bases and is a gap to gap hitter. Erick Gonzalez (2020 OF, Marblehead, MA) doubled in his first at bat for the royal team today. Gonzalez has a live bat with lots of pop in his bat. Bobby Alcock (2020 RHP, Lynn, MA) had his fastball topping out at 87mph this morning mixing in his curveball at 73mph. Alcock has a short quick arm action pitching from a high 3/4 arm slot with a physical presence on the mound. He attacks hitters with his fastball early in the count which has late life and sink to it and has good depth to his curveball. Eric Cunning (2020 RHP, Marlton, NJ): Cunning pitched extremely well in his four frames, allowing a scant run while getting a significant amount of ground balls. He's highly projectable and up to 81 mph right now with plenty more in the tank to go with good life and command. Caleb Piwnicki (2019 RHP, Alton, NH): Piwnicki pitched quite well for the Royal team, shutting out the White team over his three frames, picking up two strikeouts in the process. He works with a fastball in the 78-82 mph range with good arm side life and misses bats with a short, sharp slider as well. Michael Quigley (2020 RHP, Halifax, MA): Quigley, a UMASS Lowell commit, showed the best arm strength of the game on the mound when he ran his fastball up to 85 mph and showed the ability to miss bats with it up in the zone. Andrew Alise (2020 3B, Ithaca, NY): Alise took a very good round of batting practice on Friday night and continued to swing a hot stick in this game, ripping a backspun double to the pullside with significant carry. He's very physically strong and that strength shows in his swing. Clayton McAllister (2020 C, Swanton, VT): McAllister had a very interesting at-bat in this game, staying in against a lot of riding fastballs that nearly hit him before getting his arms extended and driving a triple up the right-center field gap, showing a good combo of bat speed and some present strength in the process. Tyler Gonzalez (2019 3B, North Reading, MA): Gonzalez, a Stetson commit, showed off high-level tools all throughout workout day on Friday and then brought them into the game on Saturday, showing off his high-end bat speed and power by driving a ground rule double to the opposite field over the right fielder's head. Joshua Beayon (2019 1B, Pittsford, VT): Beayon looked good two ways in this one, driving a double up the pull side gap with good carry and overall loft to the stroke earlier in the game then singling up the middle later on, and then getting on the mound and doing a good job pounding the zone with deceptive stuff, punching out three over two scoreless frames. Christopher White (2020 C, South Easton, MA) had a single in the game for the Black team today. White showed a line drive swing plane at the plate with a sound approach at the plate. Behind the plate White showed good defensive skills behind the plate with good receiving skills. Jordon McFarland (2019 RHP, Brighton, CO) showed well on the mound today striking out 6 in 3 innings of work. McFarland has a low effort delivery pitching from a low 3/4 arm slot with depth to his slider. Connor Bradshaw (2020 OF, New Rochelle, NY) tripled in his second plate appearance today. Bradshaw has an aggressive approach at the plate with bat speed and good feel for his barrel. Nicholas Thompson (2020 LHP, Scarborough, ME) sat 78-83mph on his fastball with his curveball at 66mph and his changeup at 68mph. Thompson has a short clean arm action with good tempo on the mound with strength in his lower half. Thompson works his fastball to both sides of the plate with big break to his curveball and maintains his arm speed when throwing his changeup. Michael Gemma (2020 RHP, Milton, MA) sat 79-85mph on his fastball mixing in his curveball at 69mph and his slider at 73mph. Gemma showed good arm speed and throw lots of strikes during his outing. Gemma has tight spin to his curveball with lots of depth to it. Jean-Pierre Catellier (2020 SS, Springfield, MA) had 2 singles this afternoon for the Col. Blue team today. Catellier has an aggressive swing at the plate hitting the ball to all fields with a level swing. Coleman Picard (2020 RHP, Auburn, MA) sat 81-85mph on his fastball mixing in his curveball at 70mph and his changeup at 77mph. Picard has a nice clean arm action with a smooth delivery and has good tempo on the mound. Picard has late life to his fastball with tight spin to his curveball throwing strikes to both sides of the plate. Rocko Brzezniak (2022 1B, Matawan, NJ) had a good showing at the plate this afternoon. Brzezniak showed bat speed at the plate with quick wrists and has pop in his bat. Thomas C Cavallo (2019 OF, Hopewell Junction, NY) singled in his only at bat today. Cavallo has a strong build with bat speed and showed the ability to square the ball up to all fields. T J Zagarri (2021 OF, Marblehead, MA) had 3 hits on the day for the gray team singling twice and doubling as well. Zagarri has a line drive swing plane with bat speed and consistently squared the ball up today. Chris Presinal (2020 1B, Boston, MA) had a good showing at the plate this afternoon. Persinal has good leverage in his swing with bat speed and centered up on the ball multiple times today. Arthur Kowara (2019 1B, Toronto, ON) singled and tripled for the green team today. Kowara has a strong lower half with a sound approach at the plate and has pop to the gaps. Gianni Fanelli (2019 OF/RHP, Berlin, CT) sat 80-84mph on his fastball pairing it with a curveball at 71mph. Fanelli showed arm speed on the mound with a deceptive delivery. Fanelli has a good feel for his curveball with sharpness to it and good break. Nick Kazarian (2019 RHP, Sutton, MA) worked four innings in his outing this morning, he showed the ability to work quick and really pound the strike zone. He worked his fastball at 85mph with good sinking action and kept it low in the zone. His slider worked at 76mph with good sweeping action, his change-up was very effective at 75mph with fading action. Nick had a nice outing this morning with 0 runs and 3 strikeouts. Benjamin Mlavsky (2019 RHP, Framingham, MA) laced a double down the left field line, showed a short compact swing, with some bat speed. Benjamin had an advanced approached in the box and showed the ability to turn on pitches with some pull-side pop. Benjamin also pitched three innings striking out five batters. He worked his fastball up to 84mph, with some downhill plane. he worked his curveball at 71mph with 11/5 shape, and his changeup at 72mph with some fading action. Ethan Student (2019 OF, Hopkinton, MA) hit a rocket to left field gap, stand up triple for Ethan. He showed good bat speed and the ability to hit for power with two strikes, advanced barrel skills. Ethan had a line drive plane with some lift, also showed good speed around the bases. Kyle Borrello (2020 LHP, Hamburg, NY) worked three innings in this mornings matchup, showed good deception in delivery and the ability to get swing and misses. Kyle struck out five batters, mixing his pitches and location very well. His fastball was 80mph, a cutter at 73mph and a change-up at 70mph. Reed Parson (2020 RHP, Leominster, MA) worked a nice outing this morning, he pitched three innings. He worked his fastball up to 84mph, striking out 7 batters, good arm side run to it. Parson also flashed a curveball with 11/5 shape to it and good depth with command at 72mph. He worked very efficient and quick =, threw a ton of strikes keeping hitters off balance. Kodai Morikuni (2019 SS, Scarsdale, NY) had a good showing defensively this morning. Morikuni made multiple great plays at 3rd and SS today showing good lateral agility with sure hands and accurate throws across the infield. Matt Ray (2021 OF, Sudbury, MA) had a good showing at the plate this morning making hard contact both times he came up to the plate. Ray showed quick hands at the plate with a smooth level swing. Cameron Burns (2019 OF, Windham, NH) looked good in the outfield for the Col. Blue this morning. Burns showed good range running balls down in the gaps and made a great diving catch in the OF. Austin Tanner (2020 RHP, Windermere, FL) topped out at 84mph this morning mixing in his curveball at 68mph and a changeup at 71mph. Tanner has a compact delivery with good tempo on the mound pitching from a high 3/4 arm slot. Tanner attacks the zone with arm side run to his fastball with good use of his lower half. Andy Pelc (2021 C, Whately, MA): Pelc showed good ability to generate leverage off of his front side and drive the ball into the air, especially to the pull side, where he showed his best power. Arthur Kowara (2019 1B, Toronto, ON): Kowara took one of the best rounds of the day overall, showing off an excellent combination of strength and bat speed resulting in well-struck, driven rising liners to all parts of the field. Ryan Van Buren (2021 OF, Meadowbrook, PA): Van Buren showed good barrel skills with the ability to square the ball up all around the zone and will grow into more power as he continues to fill out his frame. Henry Green (2020 SS, Plymouth, NH): Green showed a smooth, balanced stroke producing consistent line drives back through the middle, as well as showing the ability to work to all fields at times. Nathan Suncar (2021 OF, Hyde Park, MA): Suncar showed a quick, strong lefthanded stroke with good strength and bat speed, showing the ability to drive the ball on a line up the middle and pull side. Ethan Student (2019 OF, Hopkinton, MA): Student showed some of the best raw power of the event, working with a very strong swing that produces big time raw pop to the pull side when on time. Zachary Selinger (2019 3B, Cortlandt Manor, NY): Selinger, a Fordham commit, had a very consistent round with good bat speed and leverage out front, consistently driving the ball deep to the middle of the field with good carry. William McKee (2020 SS, Windham, NH): McKee has a very balanced approach and overall swing, creating good bat speed with a quick barrel out front, consistently working the middle of the field on a line. Andrew Alise (2020 3B, Ithaca, NY): Alise took a very good round on Friday, consistently creating leverage and driving the ball into the air with authority via an excellent combination of raw strength and good bat speed. Tyler Gonzalez (2019 3B, North Reading, MA): Gonzalez, a Stetson commit, swings with great intent and does a very good job of driving the ball into the air with authority, and projects to hit for a good amount of power at the collegiate level. Henry Gustavson (2020 RHP, Southborough, MA): Gustavson showed a very loose, easy swing from the right side with good bat speed and natural lift, doing a very good job of consistently barreling the ball up. Ryan Hyde (2019 C, Berlin, CT): Hyde consistently got the barrel out on time and with authority, showing a whole-field, rising line drive approach that he executed well. Robbie Long (2021 1B, Dunstable, MA): Long repeats his swing quite well and maintains his approach, working consistently to the middle of the field on a line and showing good hands through the swing. Matt Ray (2021 OF, Sudbury, MA): Ray had a very consistent round, doing a very good job of incorporating his lower half into his swing with good bat speed as well and peppering the middle of the field with liners. Sam Hill (2021 RHP, Northborough, MA): Hill showed the ability to both work up the middle consistently with liners as well as to turn the barrel aggressively and drive the ball into the air pull side. Rocko Brzezniak (2022 1B, Matawan, NJ): Brzezniak is extremely well built for his grade and showed off that strength in BP, consistently getting his full body into his swing and creating outstanding torque and strength, really driving the ball pullside with authority and consistency. Coleman Picard (2020 RHP, Auburn, MA): Picard took a very consistent round, consistently getting the barrel out on time with good bat speed and showing the ability to work gap-to-gap with firm liners. Thomas C Cavallo (2019 OF, Hopewell Junction, NY): Cavallo showed off some of the better raw strength of the evening, working the ball into the air with authority and serious power deep to the middle of the field. Jack Levine (2021 RHP, Yarmouth Port, MA): Levine has serious bat speed and strength and he showed that in BP, really driving the ball pullside with authority and excellent carry. Camden Lathrop (2021 SS, New Fairfield, CT): Lathrop showed off a very nice whole-field approach with a linear stroke, which he used well to work to all fields, and did show some power up the pull side gap as well. Joshua Frometa (2021 SS, Holyoke, MA): Frometa showed a nice combo of hit/power tools in this round, working to all fields on a line with quick hands and then showing the ability to really drive the ball pull side as well. Chris Presinal (2020 1B, Boston, MA): Presinal is definitely one of the physically stronger players in attendance and he showed it off in BP, showing the ability to create excellent leverage and really drive the ball with big time jump off the barrel, working deep to the pullside and pull gap.